Anti-trust paradox: Robert Bork's important contributions to law and economics. 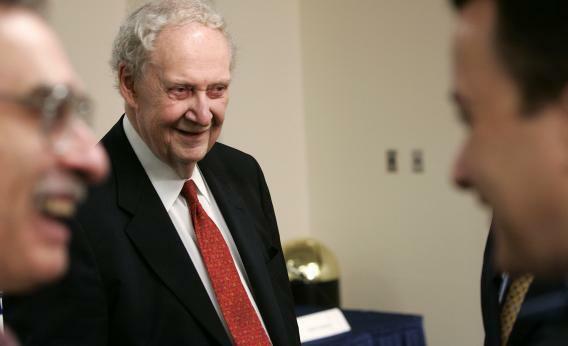 WASHINGTON - SEPTEMBER 01: Former Supreme Court nominee Robert Bork (C) smiles prior to a panel discussion about the U.S. Senate’s role on judicial nomination processSeptember 1, 2005 in Washington, DC. Robert Bork who died today is best known by 2012 as a fierce social conservative and critic of liberal rights jurisprudence. But his original claim to fame was a 1978 book called The Antitrust Paradox and which expresses ideas that have been enormously influential in the relatively dull sphere of anti-trust law. The way this arises is that the Sherman Anti-Trust Act is extremely vaguely worded by modern standards and at the same time companies generally don’t like to be involved in lengthy judicial proceedings, so both Department of Justice and judicial decisions about how to construe the Act and related laws is very important. Bork’s argument was that anti-trust regulation should be aimed at preventing harms to consumers, not simply at ensuring the existence of a hazier concept of competition. Obviously this was in line with a general deregulatory spirit that was prevailing in the late-1970s so I think it’d be a mistake to act as if the force of his arguments single-handedly won people over on this, but it was at the time an important part of shifting US political economy to one in which the regulatory state is much more focused on environmental issues and public health and much less on economic and business affairs per se.